A crossroads of southern charm and modern innovation, Historic Downtown Wilson is the heartbeat of a diverse community where arts, culture and unique business draw people day and night. Wilson Downtown Development Corporation’s mission is to lead community investment and drive the social, cultural & economic engine of an authentic Wilson by creating and promoting a vibrant, innovative & sustainable downtown. Wilson Downtown Development Corporation (WDDC), a non-profit organization , was created for the purpose of promoting historic preservation and combating community deterioration. 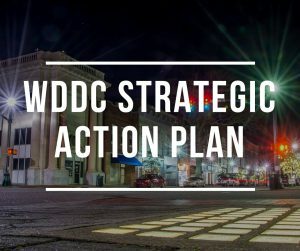 WDDC is managed by a 23-member Board of Directors comprised of downtown business owners, property owners, non-profit leaders, and city and county representatives, all of whom have a passion for revitalizing the heart of the city. They provide leadership in downtown development by delivering vision, human capital and managing financial resources. A Municipal Service District (MSD) was established downtown in 1981 in accordance with state law. Owners of property located within the MSD pay an additional $.17 per $100 value on property taxes. Approximate annual MSD revenue is currently $65,000. Revenue generated from the MSD tax is used within the MSD boundaries by WDDC for special events, marketing, redevelopment incentives and programs to realize the vision of a vibrant downtown. WDDC is a member of the National Main Street Program and is one of North Carolina’s Main Street Communities under the Department of Commerce. Following the Main Street Four Point Approach®, WDDC operates four core committees: Organization, Promotion, Design, and Economic Restructuring. Volunteers comprise these committees as well as various subcommittees. The Organization Committee, also identified as the Executive Committee, is comprised of board officers, committee chairs, and city and county representatives. Their objective is to increase ongoing strong leadership, involvement and investment in downtown by further advancing a sense of community and making downtown the commercial, social and cultural hub of the community. Staff Representative: Kimberly Van Dyk. The Promotion Committee helps develop downtown as Wilson’s premier destination for social, cultural and business activity. They develop and execute diverse and innovative ways to use marketing, communications, partnerships, advertising and special events to drive people, investment and sales in Historic Downtown Wilson. Staff Representative: Susan Kellum. 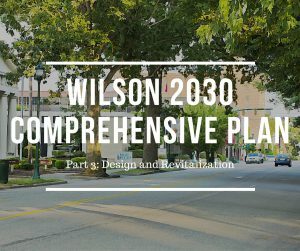 The Design Committee strives to enhance the physical appearance, aesthetics and functionality of Historic Downtown Wilson. They work together to enrich the unique characteristics of downtown, highlight historical characteristics and improve overall cleanliness, maintenance, and beautification. Staff representative: Ellen Hoj (Planning Division staff). The Economic Restructuring Committee, also identified as the Economic Development Committee, exists to support existing business, recruit new businesses and encourage positive redevelopment and investment, resulting in viable economic growth in Historic Downtown Wilson. They expand on the commercial success of downtown by working to facilitate and grow public and private investment and partnerships. Simply email HistoricDowntownWilson@wilsonnc.org with the subject line: “I want to get involved” and let us know a little bit about yourself and your area of interest.